You want peep mirrors, but they are too short? With this 1-1/2" longer extension, that problem has gone away. Chrome plated to match the peep mirror and machined to fit at both ends. 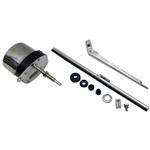 This compact, self-contained wiper motor drives one wiper arm and blade, making it perfect for your early Coupe or Roadster. Has a 90° sweep. Uses an external switch (not included). Use single control switch 910-64056 if using only 1 kit. Use dual control switch 910-64057 if using 2 kits. 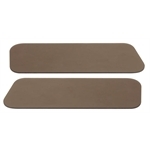 For replacement parts, use blade 911-23506 and arm 911-23505. Arm is adjustable from 7.5" to 11.75"
Attaches Speedway 12 volt wipers # 91123501 and 91123502 to windshield frame. Polished aluminum 2-piece clamp mounts to 7/8" diameter round windshield frames, like Model T and Model A Fords use. 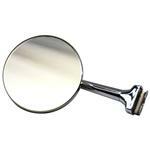 This rectangular roadster mirror measures 2-3/4" x 6" and clamps to round windshield frames of open top cars. 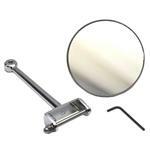 These nifty 3-1/2" diameter mirrors clip to your wind wing glass. 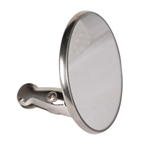 They work great as a secondary blind-spot mirror, or as an alternative to drilling into your body for a stud mount mirror. Surf's up, dude! Our plain aluminum surfboard-shaped interior rear view mirror measures 11" long and 2-1/2" tall. Can be either polished or painted to match your car. 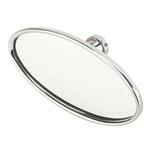 Stainless steel interior oval mirror by Speedway. Mirror glues onto your windshield. 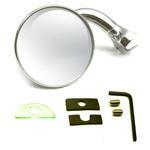 These Ford closed car exterior rear view mirrors have an adjustable hinge pin mount. 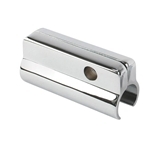 They mount to the outside door hinge with a new pin that replaces the original hinge pin. 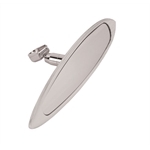 They are all chrome and feature a 4” diameter mirror head and an 5.25” arm for good visibility. Fits all 1932 Ford closed passenger cars except 3-window coupes. 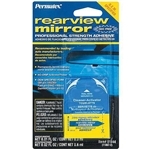 These Ford closed car exterior rear view mirrors have an adjustable hinge pin mount. They mount to the outside door hinge with a new pin that replaces the original hinge pin. 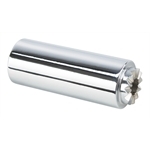 They are all chrome and feature a 4” diameter mirror head and an 8” arm for good visibility. Smoked mirror, 3" diameter. Peep mirror clamps to top edge of door. Fits right or left side, reversible. A popular and universal mirror at a low cost. Sold each. Glue for your interior rear view mirror. 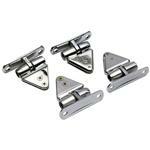 Replacement wind wing brackets for your universal wind wing kits. Surf's up, dude! Our woodgrain-finish surfboard-shaped interior rear view mirror measures 11" long and 2-1/2" tall. 16" x 6". Choose from two colors of wind wing, smoke or clear. Wing wings sold in pairs. 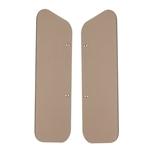 Replacement Lexan wind wings for your universal wind wing kits. Center to center of the two sets of mounting holes on the wind wings is 6 ¾"
One set of holes is 3" from the end of the wing and the other set is 6 ¼"
Universal flat face mirror clamps to door edge. Has a 4" diameter with a 4-1/2" arm. 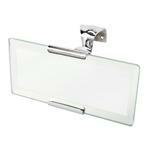 This mirror is designed for clamping on a door edge or similar component up to 1/8” thick. 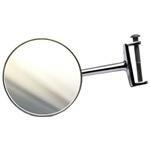 The mirror head is reversible for use on left or right side.